This article was written By Adam Hartzell on 09 Nov 2011, and is filed under Reviews. 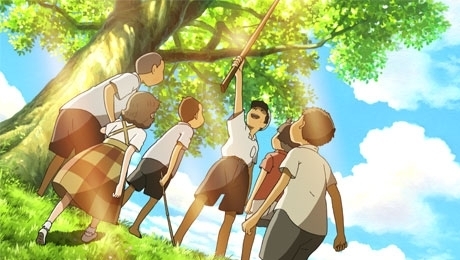 With the upcoming San Francisco International Animation Festival running at the New People Cinema in Japantown from November 10-13, I felt it was time to revisit a film I enjoyed from last year’s festival, Katabuchi Sunao’s Mai Mai Miracle (2009). Having read that Katabuchi was not only a protégé of Hayao Miyazaki, but had worked as assistant director on my wife’s favorite Miyazaki film, Kiki’s Delivery Service (1989), I figured it was the perfect surprise for my wife. But neither of us was ready for the real surprise a few minutes into the film. In the most hushed of excitement that a crowded theatre will allow, my wife exclaimed, ‘They are speaking in Yamaguchi dialect!’ My wife is from Yamaguchi City, which is where the main family of the film eventually moves. Known for its chemical industry in Ube City from where the previous prime minister Kan Naoto hails, her prefecture does not really get many close-ups from the Japanese film industry. As a result, Mai Mai Miracle ended up being an even more special cinematic treat for us. Mai Mai Miracle takes place in the mid-1950s and begins by introducing us to third-grader Mai Mai after she’s just been a meanie and destroyed her sister’s kewpie doll. Mai Mai is quite the daydreamer. She has taken the traveling of dragonflies on the water and fantasized this into a whirling crusader with whom she engages in foot races. She also takes the historical knowledge provided by her loving grandfather and breaks the space-time continuum to act as if life 1000 years ago were still taking place in her little neck of Yamaguchi. Mai Mai claims she can see these visions of local history’s past due to her cowlick, which she eponymously calls her ‘Mai Mai’. Mai Mai is a fairly popular, engaging girl and when the shy doctor’s daughter Kiiko moves to the town from Tokyo, Mai Mai is the first to befriend her and open Kiiko up to others in the community. (Although some alcohol chocolates help her open up as well, providing a funny scene where it’s nice to see the adults witnessing the aftermath refrain from overreacting.) Mai Mai’s friendship and that of the circle to which Mai Mai introduces Kiiko helps Kiiko work through the grief of her mother’s death. This circle of friends begin a project of building a dam to create a pond where they keep a communal fish named after their teacher who is leaving their town to get married. When two tragedies strike this group of friends, the kids try on adulthood roles in order to help those of their friends most impacted by these tragedies. 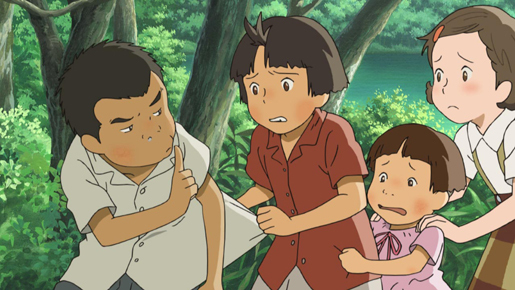 While all this is happening in the film’s present time, Mai Mai’s dreams about her town’s 1,000 year past are realized in the film as well. These scenes involve a Princess Nagiko, who looks like Mai Mai. Nagiko’s isolation in her palace has her longing for a friend to play with, eventually setting her sights on a poor girl who works in the palace and who looks like Kiiko. Although existing in Mai Mai’s imagination, Mai Mai is encouraged of the possible reality of her fantasies by archeologists working on an excavation site in her town. In Billy Ehn and Orvar Löfgren’s book The Secret Life of Doing Nothing (University of California Press, 2010), in which they bring an ethnographer’s eye to such ‘non-events’ as waiting in line, performing everyday routines, and daydreaming, they discuss the paradoxical nature of daydreaming in that “. . . it stems first from the combination of being intensely personal as well as a markedly social and cultural practice, a shared universe.” It is a skill that ” . . . includes learning to find and use props and settings that are productive for the imagination” (106). Aspects of Mai Mai’s town, such as the stream that turns at a right angle or a dragonfly skimming the water’s surface, are indeed props within a setting that has Mai Mai imagining her town’s past and her daydreams are a means to further develop her friendship with Kiiko. Kiiko then solidifies her place in the town and in her relationship with Mai Mai by eventually taking these visions on as her own. The town and their lives within it become a shared universe partly through daydreaming. Although providing pleasant visuals, Mai Mai Miracle is not of the spectacular vein of animation such as a Pixar feature, nor is it desiring to overly cute-ify or cho-kawaii it’s characters. Mai Mai is precocious, but not unbelievably so. When she seeks revenge for her friend’s father’s reputation at a nightclub, she is clearly a kid who is scared about what she just got herself into while still exhibiting extreme loyalty towards her friend. (This is also a scene bringing into question for which age group the film is intended, since suicide and prostitution are discussed in the film. They are discussed in appropriate ways for children of the age of the characters, just be ready for the curious child to ask follow-up questions.) 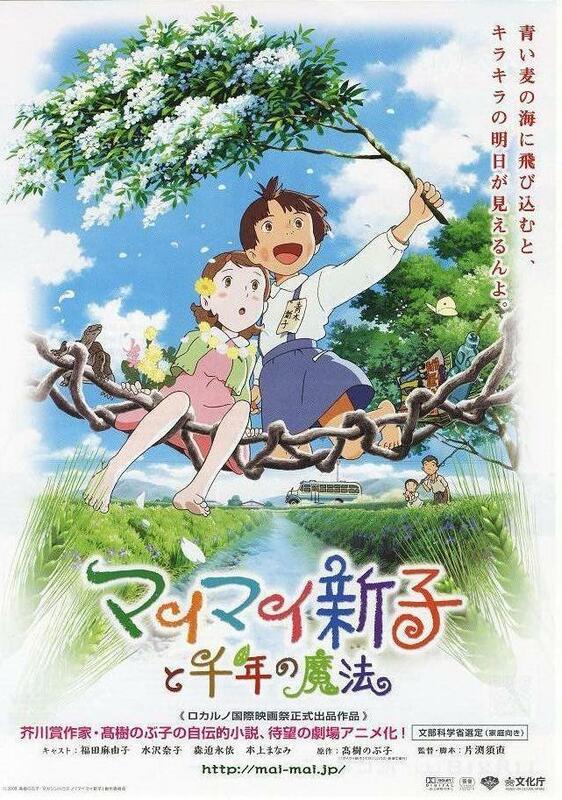 Despite the heroic adventure she takes on at the end, Mai Mai Miracle is not of the ‘Beautiful Fighting Girl’ genre famously psychoanalyzed by psychiatrist Saito Tamaki, nor do the fantasies appear in the magical realism forms of many of Miyazaki’s classics. Mai Mai’s fantasies are presented as clearly manifestations of her daydreaming and she is cognizant of these separate worlds. In this way, Mai Mai Miracle is an exploration of the everyday of a third-grader in a non-urban setting and is a pleasant film for this very reason. It is nostalgic for a time that some may claim has been lost, but it does this without critiquing present time, perhaps arguing that third-graders can still daydream like this. Although the opportunities to build a dam might be lost to today’s urban/suburban kids, they might be able to playact their own modern equivalents. Of course, the film gets personal for me in the pleasure afforded my wife in the peppering of the dialogue with Yamaguchi dialect. Mai Mai often drops cha at the end of her sentences and she will say jya-ro where your Japanese class will teach you desho. 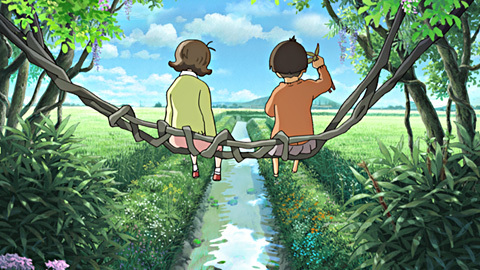 This enables a further linguistic layer to the class differences between Mai Mai and Kiiko, making their friendship ever more endearing, although a difference more subtle then the striking class difference (with financial fortunes reversed) between Princess Nagiko and her friend in the 1,000 year old fantasy flickering within the film. I am personally partial to films that step outside of the cultural centers of their countries of origin to represent regional diversity with respect rather than ridicule. That, along with the engaging story and the refusal to make up for character development by drawing and dialoguing the children as hyper-adorable, and thus hoping the audience will identify with the character just because they are cute, is what led me to purchase the DVD of Mai Mai Miracle for my wife and a separate DVD for our nieces in Ube City after seeing it in the theatre. As for what’s in store at this year’s San Francisco International Animation Festival, stay tuned to VCinema for a review of Singaporean director Eric Khoo’s Tatsumi, which celebrates the life of the legendary Japanese manga artist Yoshihiro Tatsumi.